Dr. Nigel, as his patients call him, has a passion for life. Through his journey both clinically and personally, he has embraced the realization that the body’s capacity to heal is limited only by the beliefs that we hold. With this understanding comes his inspiration and vision to help patients heal themselves. Dr. Nigel openly admits his purpose as a physician to help people uncover the causes of their pain, disease and dysfunction, and help lead by example. He holds that health is not something that you are or are not born with but a result of choices made throughout our lives which create an outcome. Dr. Nigel’s guiding principle is that health is a result of our healthy thoughts and actions; disease is also a result of our unhealthy thoughts and actions, and can only be corrected by changing our choices. With this awareness, he believes by replacing our unhealthy way of life with the healthy alternative by the bodies healing capacity and adding in what we know supports its healing ability, the body is able to feel great, increase energy and eliminate pain. 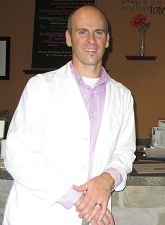 Personally, Dr. Nigel is married to Brandi and is an active dad to Nicholas, Celeste and Seth. He is also a skier, snowboarder, tri-athlete, gardener, hiker, mountain biker and nature enthusiast. He believes that nature and being close to it keeps him grounded and focused on the ability and desire to expose his three children to these activities. He embraces the notion that spirituality is the essence of life, and all physical manifestations are present are absent based upon our connection and awareness of it. He believes, we are spiritual beings embarking on a magnificent human experience. His role as a physician is one of encouragement, enrichment, and inspiration, to help all patients experience the love, joy, peace and happiness that we are entitled to using his training and experience. Contact us to schedule an appointment with Dr. Brayer.